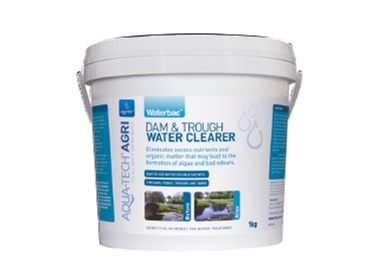 Waterbac Dam & Trough Water Clearer from Aqua-Tech AGRI eliminates excess nutrients and organic matter in water bodies (for example, in dams, ponds, creeks, water troughs or water tanks). These sometimes cause algae and can also cause bad odours. This water conditioner is a concentrated micro flora of B. subtilis (as found in the soil and most forestland streams) in a carbon/plant food base. It uses the digestive power of a single family of beneficial microbes. These microbes feed on phosphorus, nitrogen, nitrates, ammonia and decomposing matter such as leaves as well as other contaminants like manures and fertiliser run-off. By reducing unwanted nutrients, the natural balance in the water is restored. Water conditioners can result in a noticeable change in a few days or a few weeks.